After an unexplained absence of nearly three years, the al-Qaeda leader, Osama Bin Laden, has appeared once more on a 30-minute video posted on an Islamist website. The last time he was seen in a video was in October 2004, in an address to the American electorate just before the US presidential elections. 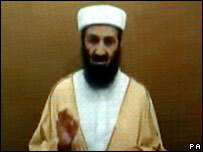 Since then he has delivered an audio message in January 2006, again posted on Islamist websites. Now this latest video message, released just before the sixth anniversary of the 9/11 attacks, will dispel the growing rumours that he has been dead for some time and remind both his followers and his enemies that the man with a $50m bounty on his head is still at large. At first glance the 50-year old Osama Bin Laden, known to his fellow jihadists as Abu Abdullah, looks younger than he did in 2004. Gone is the straggly, unkempt beard that was heavily flecked with grey. Instead, his beard appears dark, thick and trimmed, although analysts have suggested that rather than being dyed, it may be actually false, and that to help avoid detection he is clean-shaven these days. The al-Qaeda leader's face still looks tired and lined, as befits a fugitive who may well have to sleep in different locations almost every night, but it is not quite as gaunt or exhausted looking as it was three years ago. His clean white turban or, 'imma, is the same and Bin Laden wears a traditional white Saudi thaub - a long-sleeved shirt that extends all the way down below the knees. Over this he is seen wearing a cream-coloured bisht - a cloak worn by respected sheikhs, tribal elders and religious leaders in the Arab world. Not surprisingly, the video gives little away about where it was made. Unlike an earlier video which showed Bin Laden and his strategic mentor Ayman al-Zawahiri striding down a mountainside, this one has been filmed against a plain cloth background. That previous video was intensively studied by both the Arab media and Western intelligence analysts to try to determine where it was shot, and it was presumed to be close to the ill-defined border that separates Afghanistan from Pakistan. The last known sighting of Bin Laden by anyone other than his very close entourage was in late 2001 as he prepared to flee from his stronghold in the caves of Tora Bora. He is widely assumed to have travelled east, across into Pakistan to be given hospitality and shelter by certain local Pashtun tribesmen loyal to the Taleban and opposed to their own government led by President Pervez Musharraf. Osama Bin Laden is a tall, distinctive-looking man, and it is highly unlikely he would be able to pass unnoticed in urban areas such as a crowded bazaar in Karachi. This video comes just a few days before the sixth anniversary of the 9/11 attacks, at a time when Americans are growing weary of the war in Iraq and the whole "war on terror" rhetoric, and are starting to turn their attention to next year's presidential elections. The video, bearing the mark of al-Sahab productions - al-Qaeda's media production arm, thought to based in Pakistan - is not dated, but Bin Laden does make reference to recently elected Western leaders like French President Nicolas Sarkozy and UK Prime Minister Gordon Brown, which indicates it was recorded this summer. As well as reassuring his followers that he is still alive, this video is primarily directed at the US public, urging them to embrace Islam "in order to stop the war in Iraq". Bin Laden expresses amazement that the US electorate gave President Bush a second term in office, giving Bush, he says, "a clear mandate from you... to continue to murder our people in Iraq and Afghanistan". Events in Iraq, says Bin Laden, are "out of control" adding that President Bush "is like the one who ploughs and sows the sea. He harvests nothing but failure". Unlike some of the more psychopathic adherents of al-Qaeda, Bin Laden has often tried to sway the opinions of the Western public in the hopes of driving a wedge between them and their leaders, and between European countries and his most hated enemy, the US government. This, he says, has bled America dry economically. Osama Bin Laden, despite his geographical isolation, has always shown a keen interest in the global media and Western journalists were able to interview him in Sudan then Afghanistan between 1996 and 2001. This latest video, like earlier ones issued after the Madrid bombings in 2004 and just before the last US presidential elections, is a part of this strategy.